Thanks to @Pandanimaniac for this art piece! We’ve written several times about the creation of Exandria in the aforementioned posts, so we won’t rehash that for you here. What you need to know right now is that there is a pantheon of Prime Deities (good and neutrally aligned) and Betrayer Gods (of evil alignment). They clashed several times; it was bad. There was a god of death who was felled by the woman who would ascend to become the Matron of Ravens, who currently presides over the transition between life and death. The Betrayer Gods made their home base the city of Ghor Dranas, and their presence corrupted the land and the people there. At the end of their final battle, the Calamity, the Betrayer Gods were dragged behind the Divine Gate by the the Prime Deities, which none of them can now cross back into the Prime Material Plane. This event became known as the Divergence. In the gods’ absence, some of their most powerful non-deity allies and creations became demigods of their own. The year is currently 836 Post-Divergence (PD). Thanks to @FiggabooArt for this art piece! As we detailed in our Xhorhas WWKA, the drow that were drawn to Ghor Dranas by their patron deity, the Spider Queen, were morphed by the Betrayer Gods’ influence on the land. After the Spider Queen’s defeat at the end of the Stormbringer’s spear, the drow were driven underground, where some of them were pulled towards worship of the Chained Oblivion. Lately, however, they have begun to follow another, the Luxon, which they also call “The Light.” As Jester learned from Gluzzo, their symbol is a dodecahedron. Through dodecahedron-shaped beacons, the drow in Xhorhas have learned to manipulate dunamis, the magical energy whose focused study is called dunamancy. A combination of all of the schools of arcane and divine magic, dunamancy remained a Xhorhasian secret for potentially hundreds of years. Recently, the Dwendalian Empire learned about it, and appear to have stolen at least two beacons from Xhorhas. This theft likely prompted the Kryn Dynasty in Xhorhas to wage war on the Empire to get them back. Dairon, Beau’s mentor at the Cobalt Soul, suspects that there is some political connection between the two nations, though she’s still in the process of rooting it out. The Mighty Nein has learned a little about the power of these beacons since getting their hands on one. When they focus into it, they can see multiple versions of themselves throughout the threads of fate. Afterward, they gain a fragment of possibility, granting them the chance to potentially change one aspect of their experience per day (in game play terms, to reroll one d20 roll per day). Up until now, this effect has gone entirely unnoticed by the people around them, but Empress Kryn reacted to Nott’s use of the fragment in her chambers. It seems that she at least is capable of detecting the use of dunamancy in her presence. Thanks to @Joric_art for this art piece! One of the beacons stolen by the Empire was held by the Cerberus Assembly for study into the effects of dunamancy and its ability to be distilled down. The CA identified Yeza Brenatto, an alchemist in Felderwin, as the person who would be best to work with it. Though disdained by the project’s overseer, Lady Vess De Rogna (Archmage of Antiquities), Yeza successfully distilled a vial of dunamis energy from his work with the beacon. His experimentation had occasional side effects on the Felderwin populus that resembled the Kryn army’s use of it: whole swaths of people would slow down or speed up. Additionally, people reported feeling ill afterward. When The Mighty Nein got to Yeza’s basement, they discovered the tripod that the beacon would have been placed upon and Vess’ notes, but no beacon. Yeza was kidnapped by the Kryn army after they killed a hundred people, and was taken to Ghor Dranas, where he has been safely kept for at least a week or so. We don’t know who currently has this beacon. The Mighty Nein came upon their beacon in the sewers of Zadash in the wake of the Kryn infiltrators’ robbery (and attempted destruction) of the Zauberspire. The Zauberspire is the Cerberus Assembly’s foothold in Zadash. Thuron, the infiltrator, informed The Mighty Nein that the Empire had stolen the artifact from the Kryn Dynasty, who needed it to continue their chain of being reborn, with the ultimate goal of perfection. We know from Matt’s released DM notes that, had The Mighty Nein turned the beacon back into the Cerberus Assembly, they would have been rewarded with a magical item of their choosing from Pumat Sol’s shop. Thanks to @alarnia for this art piece! Almost no one else knows that the Nein have a beacon except Yussa Errenis, the mage in Nicodranas. He has now studied the beacon, and admitted that he knew nothing about it previously. The only thing he could tell was that its magic blended elements of arcane and divine magic. He cautioned the Nein to keep the beacon in their bag where it could not be scryed on, which they have done. He also seemed less than pleased that the Nein were taking the beacon into “the heart of danger.” Given Yussa’s fairly neutral demeanor, there’s no telling how he will react when and if he learns that the beacon is back in the hands of the Kryn Dynasty. From Lady Zethriss Olios, the Nein got a glimpse into the political structure of the Dynasty. There are many Dens of drow families that help run the Dynasty; the oldest is the Kryn family, another is the Olios family. Lady Zethriss is one of the three most powerful in the Olios Den, alongside her sisters. The Kryn family has been in charge since the Dynasty’s inception. Empress Leylas Kryn is at least 600 years old, and is the oldest among the drow in the Dynasty. She is known as a powerful and dangerous warrior who has lived many lives. Her den is located in Rosohna, and The Mighty Nein met with her in the Lucid Bastion, most likely in Ghor Dranas. Thanks to @GalacticJonah for this art piece! High-ranking and favored individuals in the Dynasty-- both drow and otherwise-- have the potential to become consecuted, a process that is still shrouded in a fair amount of mystery. The term’s usage in this context seems to point to some aspect this rebirthing process. “Consecution” archaically refers to a sequence, and in logic, the relationship between one thing that previously existed and the thing that comes after it. This also seems to be supported from some comments made towards the Mighty Nein regarding their willingness to risk their lives in service of the Dynasty. From Caleb’s readings about Empress Leylas Kryn being called an “umavi” and Sunbreaker Oloman referring to his “near-umavi ascension,” we’re inclined to think that “umavi” is their term for the final stage of consecution: perfection. Thanks to @MilosR3D for this art piece! Just like the Dwendalian Empire is xenophobic against anyone from Xhorhas, especially the drow, the Kryn Empire bears a very similar hatred against anyone from the Empire, especially humans. The humans who live in Asarius are treated poorly by the other citizens to the point that Caleb got harassed for just walking down the street. When the Nein went to meet with Empress Leylas, they chose to have their humans dress and behave as their slaves because that was more realistic to the Dynasty than having “Imperial dogs” in their party as equals. The Dynasty and the Empire have never had particularly good relations, with a history of skirmishes along the border and an increase in children being kidnapped by the Dynasty from areas like Nogvurot. When the Kryn army came into Felderwin to search out the beacon and/or Yeza, they didn’t go on an infiltration mission to search, retrieve, and return. They showed up with a sizeable amount of soldiers that murdered 100 crownsguard, Righteous Brand, and Felderwin residents before finding Yeza and leaving. The Empire, in turn, has captured Kryn operatives, interrogated them and “extracted techniques” for using dunamancy. Neither side is wholly good or wholly bad, and each has their own motives for their actions. As they retreated from Shadycreek Run, The Mighty Nein caught a glimpse of Kryn soldiers making a deal with some of the individuals who patrol the streets there. We never received any other context to that meeting, but it is worth noting that the Dynasty doesn’t necessarily have terrible relations with everyone on Wildemount. When they arrived back in Nicodranas and learned about the attack on Felderwin, the Clovis Concord crewman didn’t seem terribly invested in the Empire/Dynasty conflict other than being required to do their job to protect the seas, should it come to that. Yasha, who’s from the southern part of Xhorhas, noted that her tribe was forbidden from traveling to Ghor Dranas because of the terrible things they heard about that went on there. The rumors are bad enough that she would be willing to fight the Kryn. Thanks to @Mellifera38 for this art piece! The Luxon claims to be the oldest of the original gods of Exandria. The Luxon is responsible for introducing the drow to dunamancy, which lets them control time and fate. The Raven Queen, the current deity of death, oversees the threads of fate. Vess DeRogna theorized that the Raven Queen would hate how the Dynasty is messing with time and fate. Its symbol is a dodecahedron. The dodecahedron-shaped beacon is from where the Dynasty receives the Luxon’s power. The beacons allow the Dynasty elite to be reborn. When looking into the beacons, the threads of fate were visible. Empress Leylas is responsible for uniting the drow in Xhorhas under the banner of the Luxon. This brings us back around to the end of episode 2-56, where Caleb chose to pull out their beacon and give it back to Empress Leylas Kryn. Let’s take a look at the potential impact on each Mighty Nein member. Thanks to @CauseImDanJones for the following character portraits! Beau is the most directly connected member of the Nein with the Dwendalian Empire, being an Expositor of the Cobalt Soul. Her job is to root out corruption wherever she finds it and collect information where she can to enhance the knowledge of the Cobalt Soul. Her mentor, Dairon, hates the Dynasty, who was responsible for the death of people close to her. Dairon, for the record, is about 18 hours into her around 2 week long trek to Ghor Dranas after refusing to travel with the Nein so she could have a better chance of making it there. She has no idea that the Mighty Nein had a beacon, but we cannot imagine that she will be happy with Beau or the Mighty Nein (who she already doesn’t trust) if/when she finds out what’s happened. Beau, to be fair, can play this situation however she needs to, depending on who she’s talking to (and who believes her). She can be a member of the Dynasty’s heroic Mighty Nein, someone who didn’t want to give the beacon up to the Dynasty but had no choice when Caleb gave it to them, or a clever Expositor who is involved in all this to bring more information back to the Cobalt Soul and help bring down a potentially corrupted system. Caduceus is entirely disconnected from the entire Empire/Dynasty conflict. We now know, though, that he does have an interest in how this situation with Empress Leylas turns out. His vision from the Wildmother when he died was that he was on the right path towards undoing the corruption that is threatening his home, and his path leads him further east from Asarius. Ghor Dranas, where the Nein is now, is certainly further east from Asarius, but we don’t know how far his destination is in relation to Ghor Dranas. Favor from the Empress could grant him the ability to ask questions about where other temples to the Wildmother might be, or look for further hints to the cause and cure of the Savalierwood corruption. Caleb is risking the most in this whole situation for a host of reasons. His primary objective is to change the reality his past, wherein he burned his childhood home, parents inside, at the behest of Master Trent Ikithon. From his readings in the Empire, not only is that nearly impossible, but the two mages in the past who actually attempted to change the past to benefit the present were either turned to dust or never seen again. Caleb is fine with the possibility of ‘do it or die trying,’ as the possibility of changing his past has been his main drive for surviving at all. Further, if he is successful, his entire future and who he is now would change, so whatever he does in this timeline would be erased, anyway. What he has seen and heard of dunamancy has piqued his interest, as this is a whole new school of magic that focuses on the bending of fate and time. His study of the beacon previously led to interesting visions, but really did nothing for his ability to learn dunamancy. No one, save potentially some of the Cerberus Assembly (who he has to avoid at all costs because of Trent), knows anything about dunamancy in the Empire. By giving the beacon to Empress Leylas, he stands a chance at learning about dunamancy and whether he even has a shot at changing his past. This certainly isn’t a win-win situation for Caleb: it’s a calculated risk, which he’s a fan of, but calculated doesn’t mean it’s sure to work out well. The Nein have kept the beacon hidden because it could be scryed on by the Empire, and now that it’s out of the bag, the Cerberus Assembly could know soon enough that it’s made its way back into the hands of the Dynasty. That’s going to set off all the metaphorical and literal alarm bells for the CA. The Nein haven’t exactly been discreet in their travels and dealings with various authority figures, especially since Nott flat-out told Leylas that they were The Mighty Nein. Notably, The Mighty Nein went by their group name when they competed in the Victory Pit in Zadash in front of CA members Oremid Hass and Trent Ikithon, who later spoke with Yasha and Beau. Beau managed to sidestep Trent’s question about being present during the attack on the Zauberspire with a generalization that it was a big attack that was hard to miss, but Trent’s not going to have a hard time connecting the dots if word gets out about who was responsible for getting the beacon back into the hands of the Dynasty. Caleb can’t be scryed on, but Beau and Yasha sure can be, and Caleb is never far from the rest of the Nein. Another point to consider is how Caleb phrased his introduction to the Bright Queen. “I am of the Empire, but I am no friend of the Empire.” Liam clarified on Talks that Caleb noticed that none of his friends who were talking-- all of whom were races that were considered okay in the Dynasty-- were having any success in getting through to the Bright Queen. Caleb knew he had to try something totally different to cut through the noise of his friends being shackled, so he directed the attention to himself, an obvious imperial human with the unique ability to say that he has connections to their foes and he’s against them, too. It couldn’t have hurt in that very moment: if they were going to ignore him, they were just going to arrest them all, anyway. 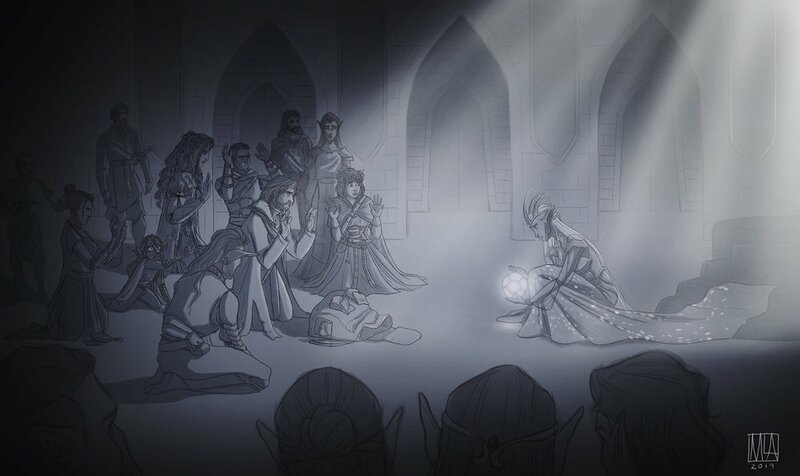 If word gets out about The Mighty Nein being there, it could potentially ease the retribution to the rest of the party from the Empire, since it was only Caleb that technically turned in the beacon to the Dynasty. Could the Dynasty only reward Caleb and punish the rest of the party? Theoretically, yes, but we already saw that the Bright Queen halted the guards from arresting all of them, and Caleb isn’t likely to take all the glory for himself, especially since we know that wasn’t his goal in the first place. Fjord, like Caduceus, is largely removed from the Empire/Dynasty conflict. An orphan from the Menagerie Coast, his only reason for being in Xhorhas in the first place is to help Nott rescue her husband. 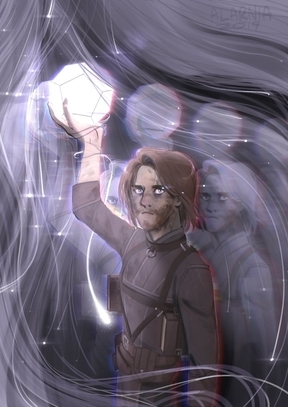 Caleb giving Leylas the beacon means that he may become a persona non grata in the Empire like the rest of the Nein, and will make traveling back to the coast an issue. Fjord may also be able to study dunamancy and the Luxon while he’s in Ghor Dranas to see if there are any solutions to his Uk’otoa problem. Jester, another Menagerie Coast native, only loses safe passage through the Empire as potential result of the Kryn getting the beacon back, which may also make travel to TravelerCon difficult, depending on where it’s held. Her worship of the Traveler is more acceptable with the Dynasty than in the Empire, especially after seeing Corvak with a Traveler symbol prominently displayed on his door. Sticking around the Dynasty may have slight more more appeal than going back to the Empire. By Caleb giving up the beacon and gaining the favor of the Bright Queen, Nott stands a real chance at getting her husband free without having to break him out and go on the run. Things potentially get complicated in the Empire if the word gets out that Nott said that Yeza is her husband. Knowing the Empire and how it treats goblins, though, the notion of a goblin being married to an Empire halfling is laughable at best, so that could be seen as a lie moreso than information to be used against Yeza. Given the Dynasty’s penchant for rebirth, however, they may understand the full truth of Nott’s situation even better than the Empire. As far as we’ve seen, the Cerberus Assembly doesn’t seem terribly concerned that its chosen alchemist was kidnapped by the Kryn. There is also the possibility that Nott could find a dunamancy mage that would be willing to change her back into a halfling, or who would know how to bend the threads of fate and time so that she was never turned into a goblin in the first place. Yasha has been on the run from her tribe in Iothia Moorland in south Xhorhas for some time, and being back in the country has been uncomfortable for her. She ran to the Empire in the first place to find a better life than in Xhorhas. She’s been *cough* quiet lately, so we’ll be interested to hear how this new favor with the Bright Queen fits into her plans.